The name Vega has been synonymous with fine quality-crafted banjos since 1889. Their combined experience in instrument making, string winding, and comprehensive sound testing make Vega strings the best choice for your banjo. All raw materials are of premium quality to assure brilliance, clarity, and longevity. We have selected a nickel/steel alloy for its tonal qualities which are best suited to accent the strong resonating tendencies of most banjos. In addition, Vega strings are highly resistant to corrosion. 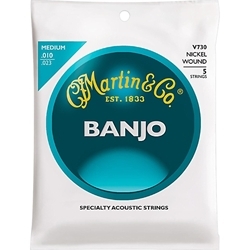 The smooth consistency of the wrap wires makes them ideal for all styles of banjo playing, whether it be the short, snappy plectrum style; the quick, flowing Scruggs style; or the rhythm driving frailing technique.